I see in front of me the photo album of my parents’ marriage, about 40 years of photos. I am going to share only some of these photos with you. I think I will start with the photo of their first house. 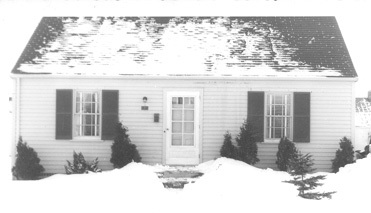 It was a 4 room Cape Cod: living room and kitchen on the left side of the house, with the bathroom next to the kitchen, and two bedrooms on the right side of the house, with an unfinished upstairs. It was virtually identical to hundreds and hundreds of other 4 room Cape Cod houses in Bridgeport, Connecticut. But it was my parents’ home sweet home. My parents bought this house 4 years after they were married. It wasn’t really a lack of money which stood in the way of them buying this house. It was more that World War II got in the way. It was a long journey that my parents had to get to this house. And to explain this journey to you, I have to go back to the beginning of this photo album, to when they were first dating. Here’s a picture of my father from that time -- he's the one on the far left. 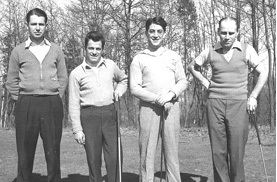 He is poised with 3 of his golfing buddies, each casually holding a golf club, on the public golf course in Bridgeport. (My father never belonged to a country club in his life, but he still enjoyed his golf.) In this picture, my father is very dapper, wearing a sweater, an opened necked shirt and a well pressed pair of single pleated pants. 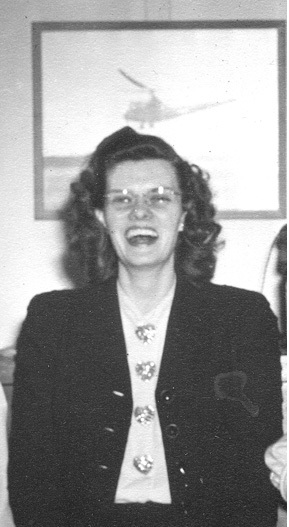 Here’s a picture of my mother as a career girl in the typing pool at Sikorsky Aircraft. (Please notice the photo of a helicopter behind my mother's head.) She dressed up for work every day. In this photo, she is wearing a dark suit with a white blouse. Covering each of the four buttons on her blouse is a pink rhinestone heart. Her kid sister told me, "Whenever your mother wore that outfit, I thought she was so glamorous!" I still have two of those pink rhinestone hearts, and my mother’s kid sister has another of them. My parents met at work during the early 1940s. They got engaged in 1942. Naturally, my mother showed off her engagement ring to her parents as soon as she got it. My mother always said, "The setting is of platinum – that’s the most precious metal. And the round, brilliant cut diamond is of high quality. Which is just as well, because one of the first people to look at it was a friend of ours, a jeweler. He put on his jeweler’s eyepiece and inspected the ring. ‘Hmm, very nice, very nice,’ he said.’"
However, my mother’s kid sister told me, "After your mother finished showing off the ring, I overheard our parents discussing the upcoming mixed marriage with her." You see, my mother was Presbyterian and my father was Catholic. And in 1942, that counted as a mixed marriage. However, my parents had been dating for a while, so the engagement didn’t come as a surprise to my mother’s parents. The engagement was more or less alright with them. Copyright 2001 by Kathryn Eike Dudding. All Rights Reserved.